In Shirdi and in every Sai Baba temple we used to see/hear a slogan like this. These words are very descriptive of the true nature of sri sai maharaj of shirdi.That is to say-Who is Sai Maharaj? What is his real nature? What is his avatar karya? And so many things in detail.Let us go to a detailed view of the above slogan. God created this universe.In this universe there are many millions of His creations.Because he created every thing, He has every right over it.He is the creater of it.Maintainer of it.He distroies it if he likes it. One who has every right to control over this entire universe He is non other than the guru God,the sai baba of shirdi. So he is the universal contriller of this entire universe,which consists of not only this earth and 84 lakhs of creaters over it,but millions and millians of earths, suns, stars etc etc…one who has control and who can command over all these millions of bramandams is the God the sadguru sai baba.so he is the anantakoti brhmanda nayak. The ruler is called the king-Raja.the ruler of some area has control over his area.like this this total world is rulled by so many rulars.One who has control over all these rulars is generally called the ruler of the rulers.he is the rajadhi raja. sadgurus sai maharaj is the king of kings,and the rajadhi raja. The king rules some physical area. But the yogis area is different. He is also a ruler. He rules his mind. He has control over the mind. There are so many yogis in this world. Who is the king of all these yogis is yogiraja. He is Sai Maharaja. Nirakara Parabrahmam. He is the creator,maintainer.and destroyer Of the universe. He is there before the creation of this universe. He is there every where in this universe. He will remain even after the destroy of this universe.Because he is the cause of it. He is invisible.he is omnipotent omnipresent And omnipresent. Veda told about him as nirakara,nirguna parabrahman.He was the sound AUM. Even if he is nirakara nirguna,he has every control over this universe.Guru sakshat para brahma.Saimaharaj is Sakshat para brahma.The universal father. Para brahman is nirguna and formless.But this sri is visible.This is the creation.Pancha bhutatmakam.the earth,the sky,the air,the fire.and the water.This creation includes this world,the galaxies,the stars and 84 lakh living creators etc.What we can see is called by this Sri.This is also called prakruthi,the nature.What is invisible and the cause for this universe,the Anantha sakthi which is indicated by parabrahmam is sai baba.And which is his creation,that is visible to all is called by Sri is also SaiBaba. Baba used to say to the question “who are your parents?”,”God is my father and the World is my mother.To them I was born”.Here we can clearly understand that the invisible parabrahma indikated by Om is the father and the visible world is the mother.Sri sai baba is the incornaton of the invisible and the visible,we have to understand. This word indicates godhood.This is very popular in Hindu Vedanta.This consists of three words.SAT.CHIT.ANANDA.SAT is the truth.Which will not be effected by Any thing.That will remain always.Sai is satswarupa.CHIT is Knowledge.it is the most powerful.Among 84 lakhs jeevarasis God presented his special quality of his to human beings to a limited extent. Knowledge is all Knowing .Knowing every thing is the another quality of god. Saibaba knows every thing. So sai is chit swarupa. Ananda is the blissful nature of God. If we realise God that same bliss will be enjoyed by us.bliss is Gods own nature. He will bless us with this Bliss.Bliss is God. Sai baba always stayed in this bliss. He is the ananda swarupa. So Satchidananda is the right word to analyse the true nature of Sai Baba. Sat Guru.guru is the person who will remove the darkness of ignorance and present the brightness of knowledge.Guru brahma guru vishnu guru maheswara and the same guru is parabrahmam also.Sat is the truth which not change with situations.It is the truth.That is the only thing that remain as it is always ie before and after creation.Guru who will lead the lifes of his followers to the ananthatatvam is the real guru.And sri saibaba is the real satguru.Through out his life time he tried to modify and make his devotees suitable to reach the godhood,the satguru is one who reach that state and who make his followers to reach the same state.Sai baba is the real sadguru. Sai is a name given to him by a person called mahalsapathi.It came to his mouth out of emotion and not given after proper verification.But it is the name chanted by mellions of people. To analyze the name sai it consists of two words sa+ayi.Sa means saguna. Ayi means Mother. Atomatically the name includes mother.It is truly approprite for baba. Sakara means with a form.Akaram. Ayi means amma.We particularly need not mention the love and affection of mother towards her child.Mother to a child is to The incarnation of love and affection. If the total love and affection of the total motherhood taken a form,no doubt it will take the shape of Shri SAIBABA of Shirdi. 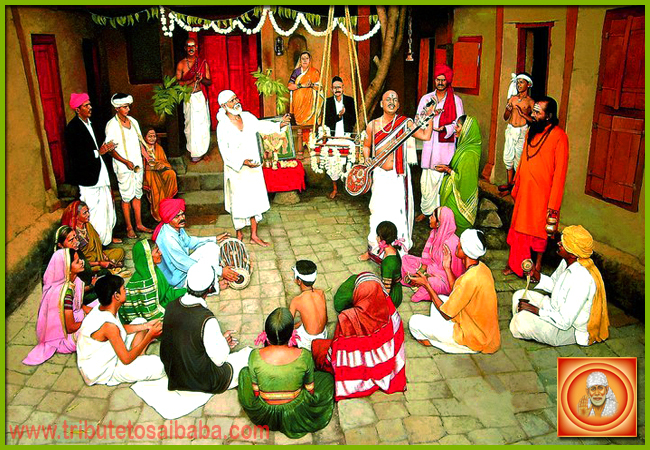 It is a conformed fact told by direct devotees of sai baba that Sai is the incarnation of love. Once again we can tell after gone through his teachings that he really the incarnation of love.The next word Nadh which means some thing like Burden taker. In the context of saibaba -to quote his words “Cast all your burdens on my shoulders,I will bear them”.He is the real burden holder of the total universe.So he was the real Sainath. Maharaj means a great personality.Yogi.Sadhu.Siddha Purusha,God incarnate.If we want to describe Sai maharaj words are not sufficient.Baba used to say”My treasure is full and over flowing.I can give you what all i have.but no one is ready to take the cartfuls of what i can give”.Saimaharaj is such an avatar particularly incarnated to bless the real happiness along with worldly happiness.Meher baba used to say if you know saibaba as much I know about him you will fell that he is the perfect master of this universe.That is Saimaharaj. Hail To Sai Maharaj – Peace To All. A Glass of Milk !